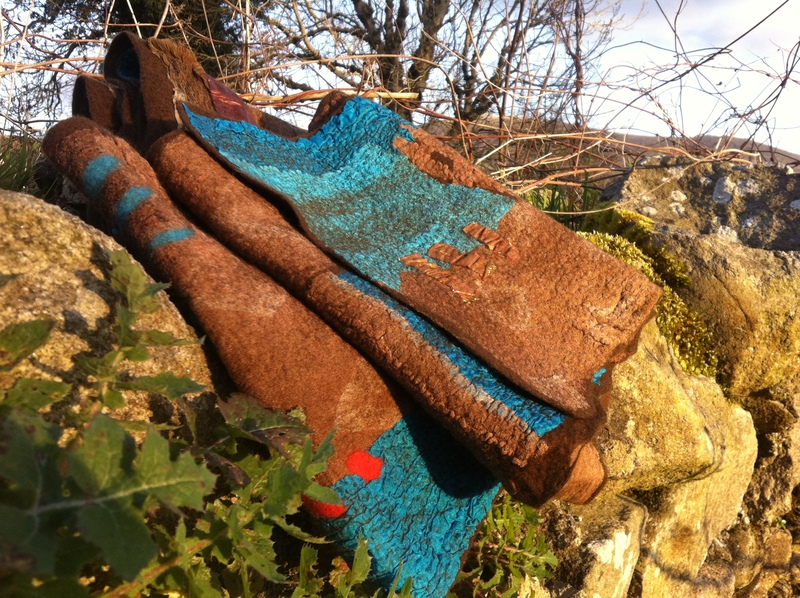 For the first time yesterday I felted a wrap in a ‘new to me’ colour combination, turquoise, chocolate and copper. 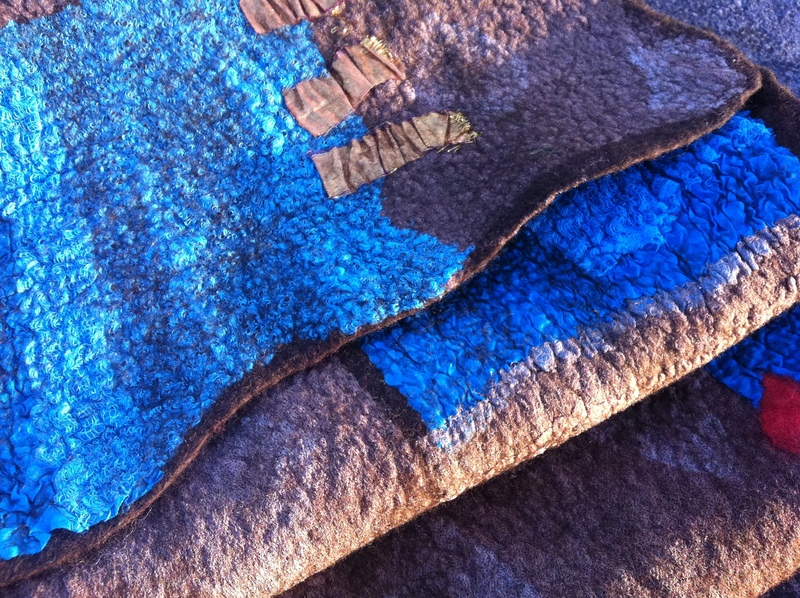 Today I felted a larger wrap using some of the same fabrics but adding a few small pieces of gold metallic mesh too. Unfortunately the light was very strong today and it was difficult to get good pictures, time was against me too as I’m still trying to gather stuff for my trip to Bulgaria but here are a couple of photos just to give you an idea of what they turned out like! This entry was posted in Felt, nuno felt and tagged Clasheen, Felt, felt wrap, nuno felt, nuno felt wrap, nuno felt wraps by Nicola. Bookmark the permalink. This new combination is beautiful……here in the states, we would call it a very southwest color combination. Really like the look. Lovely colours and textures. As Carole says, very southwest! mmmmh! love the colours have fun when you are away! Nicola, The wraps are just fantastic! It was amazing to have been there for there from inception to completion. I have to say that I had such a fantastic time in Nicola’s on Saturday and the world of felting could not have been introduced to me in a more perfect setting, or by such a fab person! Really lovely to meet you and I can’t wait for the Hat felting workshop! These are truly stunning, Nicola! Have a great trip to Bulgaria. I don’t know a whole lot about the country but looked into going on a riding expedition there last year- what a gorgeous place!